This is the opening chapter to Nocturnal Serenade, the sequel to Nocturnal Origins. I hope you enjoy. From the deepest shadows he watched, just as he had every night for the past week. He didn’t know why he watched. He didn’t need to. Past experience had taught him the less he knew, the better. His job was simple enough, at least at first glance. All he had to do was let Novacek know if the target moved and where she went. Simple enough, right? No. Nothing was ever that simple, especially when Novacek was involved. Not that he’d ever tell Novacek. Heavens, no! Stanley Middleton might be many things, but he wasn’t a fool. Aaron Novacek had the reputation of never leaving those who criticized him unscathed and Stanley had absolutely no desire to be the next to fall victim to the lycan’s anger. Stanley shivered as another gust of wind cut through the trees. If only he hadn’t been foolish enough to think he could play the two lycan camps against one another. But it had seemed like such a good plan at the time. For the last several months, the pack had been fracturing. No one had yet challenged the pack leader, but it was only a matter of time. Not that they’d succeed. Stanley had watched from the outside for too many years as Ferguson fought his way to becoming pack leader. That’s why, when Ferguson came to him and asked him to be his spy in the other camp, Stanley had agreed. After all, no one expected a weasel like him to be brave enough to actually plot against Novacek. Of course, like with so many other things in his life, Stanley had been wrong. At least he’d been lucky enough that Novacek hadn’t killed him out of hand. Lucky? Bitter resentment filled Stanley as he once more looked toward the house. Luck had nothing to do with it. If it had, he wouldn’t literally be up a tree, doing his best not to fall and break his neck as he spent yet another night waiting for the target to do absolutely nothing. Nor had luck had anything to do with it when he thought about where the target lived. Her house was a relatively new “McMansion” in one of the thrice-damned gated communities that seemed to have sprung up virtually overnight across the country. The guards at the neighborhood entrance wouldn’t let him pass without authorization – something he most certainly didn’t have and couldn’t get. Even if he managed to bluff his way past the guardhouse, he wouldn’t be able to settle down in his car near the target’s home for the long hours of waiting and watching. If the neighborhood rent-a-cops didn’t roust him, the real cops would. Nor could Stanley simply scale the stone walls surrounding the neighborhood. Security cameras mounted strategically along the perimeter would surely spot him. If the guards didn’t immediately descend upon him, the way his luck usually ran, some law-abiding resident would shoot him as a prowler and then call the police. He couldn’t even shift and sneak in. His animal was a weasel. Small and crafty. Unfortunately, like so many shifters, once in his animal form, he didn’t retain enough of his human mind to do the job. Nor could he sneak in as a weasel and then shift back. The residents of this upscale neighborhood most definitely would shoot a naked man hiding in the shadows. So that left him with just one option. He’d parked his car on a side street several blocks away and trekked through the trees separating the houses from the neighboring golf course. Now he perched in an oak tree just beyond the brick wall. Ten feet above the ground, his legs wrapped tightly around a thick limb, his back firmly pressed against the tree trunk, Stanley did his best to become one with the oak tree. The rough bark bit painfully into his legs and back, but he didn’t dare move. Moving was bad, very bad. Moving meant a change of balance, of possibly falling. So he sat as still as possible, praying the wind didn’t suddenly decide to pluck him from the limb and toss him down to the ground. And he watched and waited, fervently hoping tonight turned out to be just as uneventful as the previous six nights had been. In an attempt to forget how precarious his perch happened to be, Stanley once more turned his attention to the house before him. A single light shown from the second floor window he had quickly figured out was the target’s home office. For the last two hours she’d sat at her desk, presumably working on something important. Perhaps she was preparing a case for trial. Novacek had said she was an attorney, so that would make sense. Whatever it was, it must be important enough, or compelling enough, to alter the schedule she’d kept the past week. Every other night, she had turned off the lights and gone to bed by midnight. What was so interesting it kept her up so much later than usual? Not that he minded. It was so much easier to stay alert when she was awake. As long as she was, he had something to concentrate on. More than that, it kept him from fixating on how cold his feet were and how badly he hated hiding in the trees. Every noise startled him, leaving him convinced he was about to be discovered. As afraid as he was of Novacek, Stanley was even more afraid of the police finding him. He had no doubt what their response would be. They would accuse him of being a stalker. After all, he was hiding in a tree in the middle of the night, watching the home of a divorced woman without her knowledge. The only reasonable explanation for his actions was that he was stalking her. The only reasonable response would be to throw him in jail. But even the threat of jail wasn’t the worst possibility he faced if discovered. This was Texas after all. One of her neighbors might just decide to take matters into their own hands and shoot first, ask questions later – assuming he was able to answer any questions once the neighbor finished emptying his gun. He might be a shape-shifter but any shifter could be killed if hit with enough bullets. All it took was severing the head or destroying the heart so it couldn’t regenerate. A shudder ran through him and his balance shifted. As his stomach pitched, Stanley grabbed convulsively for the branch he sat upon. He breath exploded as fear raced through him. For one moment, he teetered on the brink of falling. Then he slammed his chest forward against the branch and held on for dear life. Nothing, absolutely nothing could pry him loose now. God, he hated this assignment. Too much could go wrong, too much he could and would be blamed for. So here he sat, his feet cold, his heart pounding and his eyes glued to the house a hundred yards away. He prayed the target didn’t suddenly decide to fly the coop. If she did, he might as well start looking for a very deep, very dark hole to hide in, because he would never be able to keep up with her, not with his car parked so far away and not with his arms locked in a death-grip around the branch he lay upon. And Novacek would never forgive him if the target got away. The back door slammed, shattering the silence of the night. Startled, Stanley’s head jerked up and his arms and legs once more tightened their death-grip around the limb before he could fall. The relief of moments ago fled, replaced by a frustration so great he wanted to scream. Damn it, why couldn’t she have stayed put like she had every other evening? The tall, slender woman all but raced across the short expanse of the yard separating the house from the detached garage. Her long legs covered the distance quickly, effortlessly. Her purse, grasped firmly in her right hand, swung against that leg, accenting every step she took. As she neared, the garage door groaned as it slid open, the inner light flooding the night beyond. What had spooked her? She couldn’t have seen him. He hadn’t moved from his perch in the tree. Not that it really mattered why she was leaving. He had one job that night – to keep track of her. If he didn’t move fast, he would lose her and he didn’t want to think about how Novacek would react to his failure. Fear replaced frustration and he quickly dropped to the ground, wincing as pain shot up his legs from the impact. Ignoring it, he turned in the direction of his car. Even as he pelted through the trees, he knew it was an exercise in futility. He would never cover the distance to his car and then manage to get to the front gate of the neighborhood before she was gone. But he had to try. He had no choice. Maybe he’d get lucky and she wouldn’t be able to leave the neighborhood before he could get into place to follow. If not that, maybe the earth would cease to exist. At least that way he wouldn’t have to face Novacek and admit he’d failed. 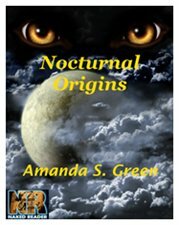 First of all, I want to thank everyone who has ordered Nocturnal Origins. I hope you’re enjoying it as much as I enjoyed writing it. I won’t lie and say sales don’t matter. They do, and for a number of reasons. Not only do they help put money in my pocket — always nice. After all, coffee — that elixir of life — does cost. But sales will also determine if I get to write the sequel that has been demanding to be given life. In the meantime, I’ve been going through my files to see if anything calls to me to be written and came across this. Hope you like it. Because sure as my name’s Lexie Smithson, the minute I get married and move out, Mama will be packing her bags to join me. It won’t matter if I want her to or not. All she’d care about is finally being able to get away from Papa and the rest of the family. It wouldn’t even matter that I’m the least favorite of her kids. Like I said, reality rarely interferes with my mama’s plans. Of course, I am an ungrateful and unobliging child. I’ve no more found a bus to hit me than I’ve been able to keep the family skeletons in the closet. The former I have no control over and the latter, well, I swear I don’t mean to let them out. At least not usually. It’s just that they make so much noise, what with all their moaning and the rattling of their bones. Sometimes I just can’t help it. It doesn’t help that it always seems to happen at the worst possible time. Like when Mama’s women’s group was meeting in our parlor last Sunday after church. Mama had just served the iced tea and lemon pound cake. She’d even managed to make the house smell more like a garden than a funeral parlor. Everything had been as close to perfect as was ever possible in our place. Then Aunt Minnie decided she just had to join in on the fun. Now I ask you, was it my fault she wanted to be a part of the meeting? She’d been a member of that women’s group since the very first meeting more than twenty years ago. Everyone there knew her. Just as Mama knew she was there – how could you forget? Besides, all Aunt Minnie had wanted was to find out what the no-account scoundrel of an ex-husband of hers had been doing with the new church secretary. Really. I swear, those women sure did over-react when Aunt Minnie rattled in and sat on the settee next to Miss Pearl. You’d have thought Miss Pearl had seen a ghost the way she shrieked and then fainted dead away. Okay, maybe Aunt Minnie smelled a bit. But we’d buried her in her best Sunday-go-to-meeting dress and it was just as pretty that afternoon as it had been at her funeral six months ago. Mr. Perez, the local undertaker, had even been by just the day before to give Aunt Minnie one of her treatments. So she looked pretty much like she had before she passed. Sure, her skin sagged a bit more than it used to and she had a slightly yellow tinge, but that was all. Really. Besides, old Missus McIntyre was wearing enough lilac scent to cover the smell. I’m here to tell you, those ladies scattered like dandelion parachutes in a strong wind. It took me more than an hour to calm poor Aunt Minnie and coax her back into her closet. I don’t know if she’ll ever come out again and that’s a darned shame. She always was the best at gossiping and, honestly, there’s not much else to do in this backwater town on a cold Sunday afternoon – or just about any other time, come to think of it. Now Mama, well, she was beside herself with frustration, indignation and mortification. Even as she swept up the last of the lemon pound cake from the carpet where Mary Beth Tully dropped it on her mad dash for freedom, she blamed me. Mama swears I do things like this solely to embarrass her. I’m the ungrateful child, you see, not perfect like my sister Patty and certainly not important like my brother Brett, also known as Bubba – which he just happens to be. No, I’m too much like my granny, the bane of my mama’s existence even now, ten years after she drew her last breath. Mind you, Granny might have passed but, like Aunt Minnie, she didn’t pass on. Maybe I ought to explain. My family’s never been what you might call “normal”. We’ve had more than our fair share of oddballs and loners and crazy cat ladies. Most families in Misty Creek do. But things took a decidedly sharp turn to the left of weird the day Perfect Patty came home complaining about how Old Lady Serena had given her the evil eye. Nothing’s been the same since.